Being whole means being healthy. Our health initiatives advance physical, mental, emotional, relational and spiritual health. 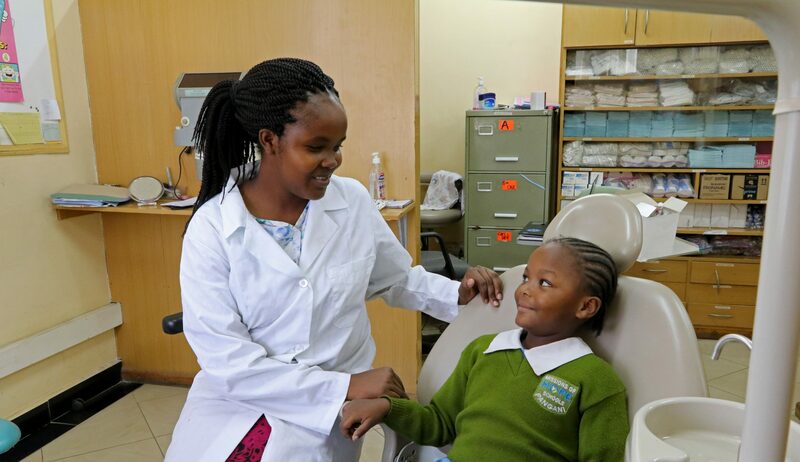 Three separate MOHI medical and dental clinics deliver quality, affordable healthcare to our students, their families, and the communities we serve. They are located in our Pangani Center to serve our Nairobi communities, our Joska boarding school, and in our Napuu Center to serve our Turkana Centers. In rural areas, our clinics provide access to healthcare where it’s limited or doesn’t exist. Our medical team also coordinates with visiting medical teams to provide medical screenings for our students. We increase the general welfare of the communities where we serve. Within neighborhoods, community development starts with relationship. Through community health evangelism (CHE), we engage and equip one community member to equip and mobilize others. We help communities identify their needs, evaluate their God-given resources and find solutions to improve their lives. For example, community gardens, clean-up days, or construction of public restrooms. Through our child survival program, we teach expectant and new mothers proper prenatal care and healthy nutrition for infants and toddlers. We also model and teach disease prevention and healthy habits to our kids and families.Then they teach these lessons to their friends and neighbors, multiplying the benefits to transform communities. We support and empower marginalized groups to reduce discrimination and build positive relationships. We organize post-test clubs for people living with HIV so they can support each other emotionally and financially through group savings accounts and job skills training. Our disability program fosters healthy physical and intellectual development for children with special needs and nurtures stronger family bonds by teaching parental skills in the home. We counsel those who have experienced trauma or difficulties in daily life to enable them to succeed. Home visits by our social workers and other staff uplift community members and show them that they are valued and not forgotten. Every life is valued. Dignity is restored. Good health is increased. From home to home and throughout communities.